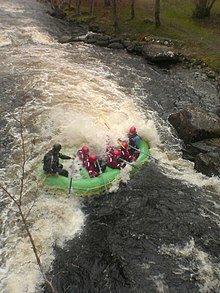 Class III rapid at Canolfan Tryweryn, Wales. The international scale of river difficulty is an American system used to rate the difficulty of navigating a stretch of river, or a single (sometimes whitewater) rapid. The scale was created by the American Whitewater Association to evaluate rivers throughout the world, hence international in the title. It should not be confused with the internationally used whitewater scale, which is published and adapted by a committee of the International Canoe Federation ICF. The grade reflects the technical difficulty and skill level required associated with the section of river. The scale is of use to various water sports and activities, such as rafting, riverboarding, whitewater canoeing, stand up paddle surfing, and whitewater kayaking. Classifications can vary enormously, depending on the skill level and experience of the paddlers who rated the river. For example, at the 1999 International Conference on Outdoor Recreation and Education, an author of a paddling guide pointed out that there is too much variation in what is covered by the Class I designation, and proposed making further distinctions within the Class I flat water designations and Class I+ moving water designations, with the goal of providing better information for canoeists, instructors leading trips, and families with young children. ^ a b Charlie Walbridge; Mark Singleton (2005). "Safety Code of American Whitewater". American Whitewater. Retrieved 2015-01-07. ^ "International Scale of River Difficulty". American Whitewater. Retrieved 2015-01-07. ^ "whitewater scale organisation". Deutscher Kanuverband. Retrieved 2016-04-19. ^ "whitewater scale DKV" (PDF). Deutscher Kanuverband. 1979. Retrieved 2016-04-19. ^ Cassady, Jim; Fryar Calhoun; Bill Cross (1994). Western whitewater: from the Rockies to the Pacific, a river guide for raft, kayak, and canoe. Berkeley, CA: North Fork Press. ISBN 9780961365042. ^ Ron Watters. "The Proposed Expanded Class I System of Rating Rivers". Proceedings of the 1999 International Conference on Outdoor Recreation and Education. Idaho State University. Retrieved 2010-09-01.